Card done for Thomas' birthday, January 2018. Thomas had dropped several not so subtle hints that he wanted a Doctor Who card with the current Doctor on it so, not being one to disagree with his choice, here we go. Done with polychromos pencils and built up in layers, utilising my pressure application and layering techniques, the picture consists of 25 colours. 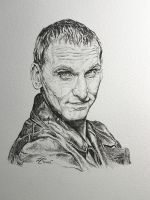 The Doctor's eyes were done with phthalo blue, medium flesh, dark sepia, cold grey 3, Prussian blue and warm grey 1. His eyebrows were done with dark sepia and cold grey 4. His nose was done with white, medium flesh, light flesh, dark sepia, Payne's grey and black. His ear was done with medium flesh, light flesh, dark sepia and warm grey 5. His mouth was done with phthalo blue, medium flesh, dark sepia, Payne's grey black, warm grey 1 and warm grey 6. His skin was done with white, phthalo blue, medium flesh, light flesh, dark sepia, Payne's grey and warm grey 5. His hair was done with white, phthalo blue, violet, light ultramarine, light phthalo blue, dark sepia, Payne's grey and black. His clothes were done with white, phthalo blue, light blue, Payne's grey and black. The light effect was done with white, light orange and warm grey 3. The Cybermen were done with white, phthalo blue, sky blue, dark phthalo blue and Payne's grey. The unfocused background was done with white, phthalo blue, medium flesh, red violet, oriental blue, night green, dark sepia, Payne's grey and chrome oxide green. Original image: Doctor Who episode 847 'The Doctor Falls'.